Load Management is the essential part of every Industry. DG Load Management and DG Synchronization are two different terms and have different meanings. We have already understood the DG Synchronization. 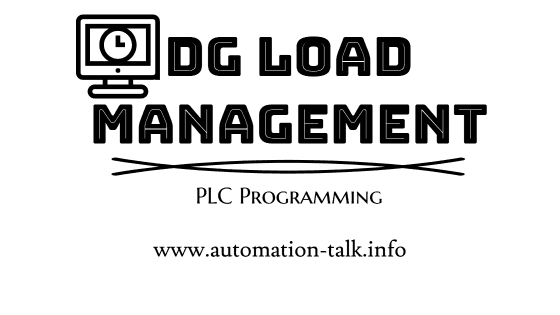 In this article, we will try to understand the basics of DG Load Management and also its PLC programming. What is DG Load Management? Load Management as the name tells is the "proper management of load" means balancing the electrical power supply with the load and its behavior. As we all know that there are DG Sets used in Industries for Power Back Up. When the mains fails the DG 1 starts and when the LOAD Increases then the BUS Coupler Closes and DG 2 also starts to Match the Electrical Power with the LOAD. In the LOAD Management there are BUS Couplers and the closing/opening of these Bus Couplers maintain the Load management. How to do Load Management? Since electric power cannot be stored and used later, so Electricity is produced and distributed and consumed by Load and it is the place where Load Management Comes into Action. Also as the Load demand is not fixed so we have to design the system keeping in mind the Maximum Load Condition. As for example when the Induction Hardening Machine is started then at a sudden the load increases by 400 - 600%, so we have to keep in mind all these behaviours of loads. There are many ways for Load Management but here we will focus on Load Management using DG. To do Load Management using DG Sets we will need an Energy Meter that will tell us all the data regarding voltage and current and it will help us to determine the load value. The Energy meter will be connected with PLC in MODBUS via RS 485. We have made this plc program for 2 DG Load Management and using Omron PLC. There are two sections in PLC program , one is for reading data from Energy meter and other is for plc logic. We have put comments at all places in PLC logic and you will be able to understand it easily. You can download both .pdf and .cxp files from below. Also you can subscribe to get all latest updates in PLC programming and SCADA Tutorials. Subscribe to Automation-Talk by Email.